The outgoing president has promised to liberalize the political system and defeat corruption. On Dec. 22, Dmitry Medvedev began his fourth and probably final address to the Federal Assembly of Russia with a brief comment on the outcome of the elections to the State Duma that were held earlier this month. "This always happens," he said of the post-election protests. The president promised to listen to the voices of discontent "where criticism is valid" and to prevent outside interference in Russia's internal political life. "Increased political competition" was the outcome of these elections, the president said. Judging by his proposals, this competition will intensify in the near future. 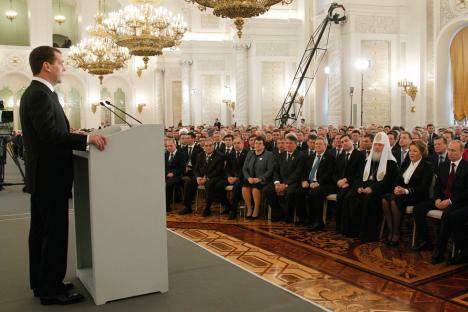 In the part of his speech that focused on reforms to the political system, Dmitry Medvedev endorsed the proposals of Vladimir Putin, who had previously talked about the need to return to direct elections for regional governors. But he did not limit himself to that. The president also intends to introduce legislation that should simplify the procedure for registering political parties. Before the parliamentary elections, the Ministry of Justice refused to register several civic organizations for formal reasons, which was one of the causes of the disagreement over the outcome of the vote. Currently, the Constitution does not require any regional representation in the Duma. Medvedev intends to remedy this situation. He suggests that the lower house of parliament be formed on a geographically proportional basis. He spoke about the need to reform central and regional electoral commissions. They will include representatives from all political parties. Another important political innovation is the decentralization of power. The president's initiatives do not supersede the "vertical power structure" built by Vladimir Putin, but they significantly expand the powers of regional governors and municipalities. The initiatives are also expected to give regions more freedom in the allocation of financial resources. According to the president, in January work should begin on creating an “open” government – that is, ways to engaged the public in policymaking. One of the first projects will be an Internet portal where each user will be able to describe the most harebrained bureaucratic procedures. The officials who are the "competition winners" will face repercussions, and the absurd procedures will be repealed. The president acknowledged that the fight against corruption in Russia has only just begun and talked about how it will continue. If his initiative is adopted by parliament, officials will have to declare their purchases of land, other real estate, vehicles and securities, as required by the UN Convention against Corruption. Medvedev promised that the list of those required to declare their incomes will be expanded. In addition, he is pressing for a change to the current bribe-heavy system for government procurement and for a restriction on state deals with companies that are owned or managed by relatives of officials. "Russia's foreign policy has become more modern," Medvedev said. In particular, he believes that the process of integration into the CIS has been very successful. According to the president, these countries have contributed to a growth of 20 percent in the duty-free sales market for Russian products, "according to the most conservative estimates." Medvedev is also satisfied with Russia-EU relations, in particular with the agreement of modernization partnership and with the progress in cancellation of the visa regime. In terms of U.S.-Russia relations, the Russian president warmly recalled the New START Treaty, which "contributes to strategic stability" and "has laid the foundations of new equal and indivisible security architecture." He also said that Russia is ready for a dialogue on missile defencs, if its partners would “learn to listen to us." Medvedev believes that overcoming the global crisis is one of the constant priorities for international cooperation. "It is now essential to fully implement the decisions adopted by the G20 to stabilize the financial situation of a number of leading countries, and to reform the international financial system," the Russian president said.